E-Readers: Which One Is Best for Your Bookworm? What Would be Unique About an Amazon Kindle Phone? The question about ebooks is not if they will pass print, but when. The short answer is ... not yet, but we'll have a much better idea in January. 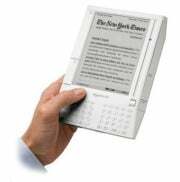 Buzz around the young format has been building since the first mass-market ereader, the original Kindle, sold out in less than six hours in 2007. Amazon, which has estimated it holds over 70% of the ebook market, has stayed in the spotlight with new devices like the Fire tablet (see "Amazon Kindle Fire vs. Apple iPad 2") and two new Kindles it unveiled in September, but also with repeated declarations of how ebooks are flying off its virtual shelves. The company said in May that its digital books were outselling its print books, after reporting last year that they had eclipsed hardbacks. The latest pronouncement was headline-perfect and ricocheted around the Internet and media outlets as the latest sign that paper books are on their way to extinction. Amazon doesn't disclose its metrics, however, and some pointed out that the company's numbers refer only to unit sales, which could easily be swayed by the thousands of cheap titles available, many for less than a dollar. In July, Amazon said its Kindle store had 950,000 books on offer, 800,000 of which were $9.99 or less. In the overall market, ebooks represented just 6.4% of total revenues for books published for the general public last year, according to the Association of American Publishers, whose membership includes the country's major publishing houses. But that is changing. The group later released a report on the first five months of 2011, showing that ebook sales had risen to about a fifth of the overall pie during that span, soaring 160% while total hardcover and paperback sales were both down nearly 20%. Retail sales have taken a hit this year as the national Borders chain closed its stores after declaring bankruptcy. The trend will accelerate as more readers buy dedicated ereaders as well as tablets and phones that can display the books, which is why this holiday shopping season is important. Analysts have long held up $100 as the line for general acceptance for such devices, and while Amazon's $199 Fire tablet has drawn much of the attention because of its matchup with the iPad, the company's two new kindles are $79 and $99 when purchased with advertising. Offerings from Barnes and Noble (See "Android lovers: don't overlook the Nook" and dedicated manufacturers like Aluratek have offerings slightly higher, near $130. One disappointment to users so far has been the pricing of ebooks; Amazon currently lists many books where the Kindle version is more expensive than the print version, after it lost a battle with publishers to fix the pricing of its ebooks. Prices should come under pressure as competitors such as Apple and Google assert their own ebook offerings run on their native software. So as ereaders become more popular, users will naturally look for alternative, cheaper ways to fill them with content. One sign of their popularity will be libraries, which monitor their users closely to make better use of tight budgets. Already 67.2% of libraries offer some access to ebooks, according to a report issued by the American Library Association in June. Local media reports mirror this trend - an October article in the Boston Globe said ebook borrowing rates are climbing quickly at area libraries, although print titles are still far more popular. Another factor that could drive readers to the devices is exclusive content. J.K. Rowling's new "Pottermore" website, for example, will begin offering Harry Potter ebooks from 2012. The remainder of 2011, with cheap ereaders and tablets on the market in plenty of time for the holiday shopping season, and ebooks more widely available then ever before, will show the strength of ebooks vs. print.